In the end, we have achieved something special, but only available in limited quantities because many of the processes needed to build Carbon Ltd. do not lend themselves to large scale production. The badge requires three months to produce a single run, we use 9 separate processes just to produce the perfect triple chrome plated finish. The feet appear almost liquid, reflecting both their surroundings and the owner’s taste exquisitely. Chrome plating over Old World die-stamped embossed logos, carefully back-filled using organic enamel; another age-old technique that harkens back to a time of carriages and horses. Carbon Ltd. blends modern and antique artisanal craftsmanship into a single, seductive whole. A perfect 12” carbon fibre driver is a thing of genuine beauty, both physically and technically. Carbon fibre offers the ideal combination of ultra-light weight–a REL touchstone for over a decade–with a tough, resilient and extremely quiet cone structure that produces wickedly fast, sensationally deep low bass. To produce the high output levels our clients expect, we endowed this bass engine with a full 4” (100mm) of stroke, enough to supply the prodigious output appropriate for such a special model. 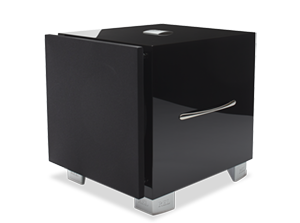 REL amplifiers are expected to produce very fast, tightly controlled deep bass with explosive dynamics, and do so for years on end. The 550W NextGen2 amplifier offers standard setting reliability with many thousands of this high current amplifier having been produced over the past decade. And with industry-leading fast, musical input filters, transients so important to the full enjoyment of music and theatre arrive without dynamic compression or the sort of dull, heavy character many subwoofers are guilty of delivering. Carbon Ltd. includes a state-of-the-art wireless Longbow receiver built into the filter board, seamlessly integrating modern wireless into a classic subwoofer design. All you need to do is purchase the Longbow Wireless transmitter. Zero compression means that musical and theatrical signals are beamed one-to-one, in a bit perfect manner without resorting to severe compression best suited to mobile telephones. Discrete D/A convertors and A/D encoders are used internally, along with separate analog and digital power supplies. It even comes out of standby flawlessly, as the main on-off standby circuit takes into account Longbow’s wireless signal and comes to life as intended. Explore the easy-to-use, zero-compression, embedded Longbow wireless system for No.25, Serie S that frees you from conventional cables.